You are here: Home / Weekly Columns / Opinion / Everything You Need To Know About Newborn Car Seats. Everything You Need To Know About Newborn Car Seats. The most vital thing you can purchase for your newborn is an infant car seat. No matter how prepared you are, that drive from the hospital to bring your baby home is one of the most nerve-wracking experiences for any parent. However, if you have a child safety seat will ensure your baby’s safety, and you’ll feel more comfortable throughout the ride home. You can get overwhelmed when on the market for a car seat since there are plenty of models and brands to choose from. On top of that, you also need to consider its features and your budget. 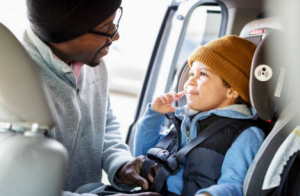 You also have to be aware of the car safety guide for newborns and infants, and that the seat or any baby products you’ll buy are certified by the Juvenile Products Manufacturers Association to ensure safety and quality. Rest assured though that every car seat out there are required to meet the government safety standard and has undergone crash tests. Even before you give birth to your precious angel and whether you have a vehicle or not, you need an infant safety seat ready. You have to be careful when using a borrowed or secondhand car seat. It is imperative to know if it has never been involved in an accident. You also have to check for any signs of wear and tear. Furthermore, you need to read its manufacturer’s manual carefully for installing the seat correctly. Majority of experts recommend buying a new car seat and choosing the right one suitable for your child’s weight and age is vital. You also have to make sure that it is installed correctly. If you find it hard to fasten the safety seat in place or does not fit your vehicle perfectly, then look for another one. Not all car seat fits all vehicles, and there are also some seats that work well in some vehicle models than others. Infant carrier. This type is good through your baby’s first year and can work as a travel system as well. It typically comes with a stay-in-car base which stays inside of your vehicle. You can also attach it to strollers that it is compatible with. It’s highly convenient, and you’ll not risk waking your sleeping baby since you do not need to snap your infant in and out every time you take him from the house to your car then to the stroller, and back again. It’s the best choice if you’re always out and about, just ensure to choose a model with a comfortable carrying handle. Convertible car seat. This car seat stays in your vehicle, and you have to buckle and unbuckle your baby every time. It also does not come with a separate base and handle for carrying option. You can use it longer though since you can transform it into a forward-facing once your baby outgrows the rear-facing seat and has a higher weight limit which is about 40 lbs. You can also opt for a 3-in-1 car seat as long as it has a rear-facing mode. It is also essential that your infant fits into its weight and height range to ensure he’ll be safe during the ride. You can find all this information in the seat’s manual. Choose a seat with a five-point harness that’s easy to adjust. Its buckle should also be simple to fasten and unfasten. Although it may seem like a luxury, but the seat’s padding and material should feel cozy and soft to the touch to keep your baby as comfortable as possible, especially during the first few months of his life. Head support. Your baby’s neck is not strong enough to support his head when holding it up. When shopping for a seat, consider getting those with an insert for supporting his head, which is a safer choice compared to using attachments. Side protection. For utmost protection in case of a side-impact collision, look for an infant car seat with side walls that are deep as well as enough barriers for the neck, spine, and head. Energy-absorbing foam. This is helpful in keeping your baby safe and protected from impact in the event of a crash. Expiration date. The lifespan of a car seat is normally around six years. Its plastic tends to become brittle after that. When you need to borrow a seat, this is something vital that you need to check. Also, make sure that any seat you will use, whether new or used has a label containing its instructions, model number, and the expiration date of the manufacturer.